Find creative inspiration for your home and decorate every inch of it the way you’ve always imagined. Why stop at just your walls when you could be bringing your living space to the next level with a ceiling decal? From the huge collection of ceiling wall designs available in the market, it is very important to select a design that’ll completely change the look of your home, making spaces appear grander, larger, and bolder. 1. Make your light fixtures more unique. Don’t buy a completely new light fixture for your living space if you don’t need to. Fall back in love with your lighting by surrounding it with a ceiling decal. Not only have you created a customized look, but you’ve made your light fixture appear more expansive which creates the illusion of more light in a room. Choose the color of your decal to match the finish of your lighting to create an even more seamless and elegant appearance. 2. Make the room look grander and appear larger. When the eye is drawn upwards, your ceilings will appear to be higher up, and your living room will appear much bigger. 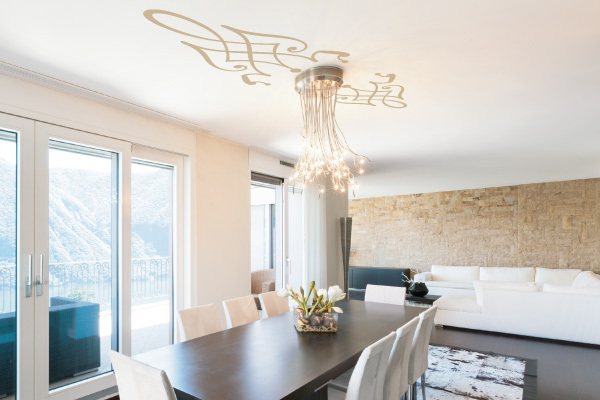 Immediately create the look of a larger room by decorating your ceiling with artistic vinyl wall decals that’ll wow guests. 3. Create a more ornate look. Whether it’s creating the look of crown molding without the cost, or finding your own custom design among our collections, you’ll be designing a very impressive room. 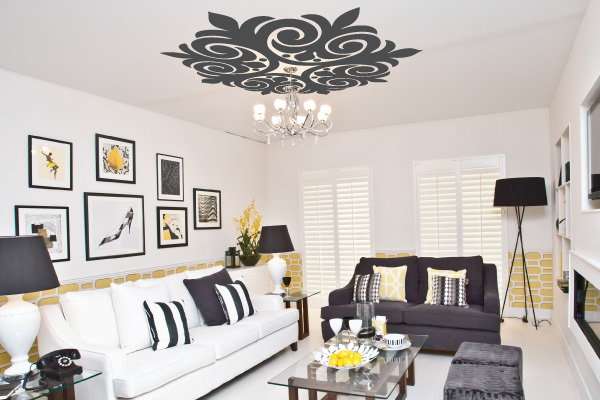 A ceiling decal is an affordable option, but makes your room look much more valuable. It’s the best of both worlds! 4. Add subtle color to a room. Think your room needs something to make it a little more lively? 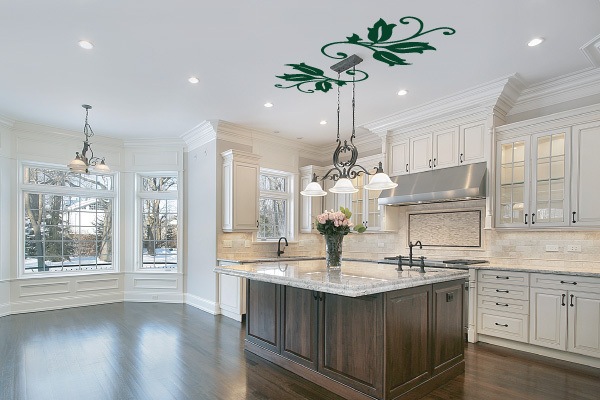 Add your personality to the space by choosing a ceiling decal with color. You’ll add a subtle hint of brightness to your living space to make it more comfortable and inviting. From there, you can choose some accessories such as throw pillows to match the decal to complete your space. Find inspiration with a ceiling decal and immediately pull together the perfect theme for your living room. 5. 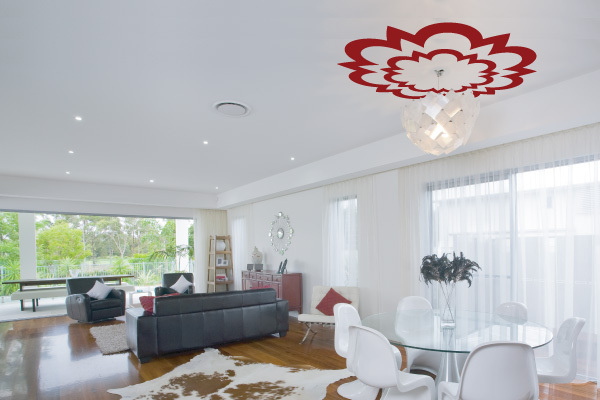 Create symmetry around a ceiling wall decal to avoid a cluttered room. When your ceiling wall decal has been set up, choose a more basic piece of furniture to place below the decal. Whatever you choose will compliment the decal above it in a way that should not be competing. What should catch a guest’s eye is the decal itself. 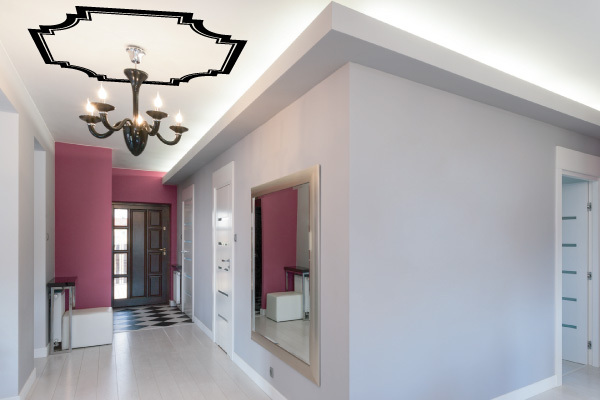 Another option for you is to arrange your furniture around the decal to create a symmetric look that allows the ceiling to be shown off, beautifully framed by the furniture underneath it. Regardless of where you place your decal, be mindful of your decoration below it! Shop Walltat's entire Ceiling Decal section today!